Örnsköldsvik [œɳɧœldsˈviːk] is a locality and the seat of Örnsköldsvik Municipality in Västernorrland County, Sweden, with 32,953 inhabitants in 2017. Montage of a variety of famous places in Örnsköldsvik. Its natural harbour and archipelago is in the Gulf of Bothnia and the northern boundaries of the High Coast area. It is well known as an exporter of pulp and paper products and heavy machinery goods. It has a strong environmental record and is the "testbed" for ethanol-powered cars. Traces of human activity in the Örnsköldvik area date back to the Nordic Bronze Age and there is a reconstructed Roman Iron Age village called Gene fornby that is a popular tourist attraction just outside the town. However, Örnsköldsvik itself is a relatively young city; it was founded as a köping (a Swedish market town) in 1842 and became a city in 1894. Its name originates with the surname of governor of Västernorrland County from 1762–9, Per Abraham Örnsköld, and means "Örnsköld's Bay". The surname Örnsköld literally means "Eagle Shield". 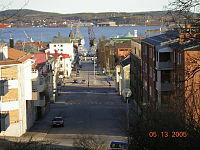 The town of Örnsköldsvik is the centre of Örnsköldsviks Kommun or Örnsköldsvik Municipality. The Municipality has a much larger population than the town itself, at over 56,000 inhabitants, as the municipality is vast with very large forest areas, and consists of several rural communities. Historically, the most important economic activity was trade and heavy industry. In the surrounding villages (now incorporated into the city itself) two major industrial ventures arose: Modo, a pulp, paper, and logging enterprise now known as Holmen, and Hägglunds, a heavy industrial company. Even today, successors to these two companies are of great importance for the city. The Finnish-owned Metsä Board runs a former Modo locale, one of Europe's largest pulp mills, in the village of Husum 30 kilometres (19 mi) north of Örnsköldsvik, Domsjö Fabriker, another ex-Modo mill), runs a specialty cellulose mill in Örnsköldsvik, while Hägglunds is split into several companies, including BAE Systems Hägglunds, a subsidiary of BAE Systems. Other notable companies based in Örnsköldsvik include Svensk Etanolkemi, a producer of ethanol products, and Fjällräven, a manufacturer of wilderness equipment and clothing. Umeå University has a campus in Örnsköldsvik. The asteroid 6795 Örnsköldsvik, found in 1993 by Swedish astronomers at the European Southern Observatory, was named after the city. The European route E4 runs through downtown Örnsköldsvik. Main road transportation is provided by the European route E4. Örnsköldsvik Airport provides daily flights to and from Stockholm Arlanda Airport courtesy of Höga Kusten Flyg, and also charter flights to Turkey courtesy of Pegasus Airlines. The terminal building was recently upgraded to allow for some international services. The runway was extended to allow service for larger aircraft. Railway transportation is provided by the recently opened Bothnia Line. Completed in August 2010, the Bothnia Line adds 190 kilometres (120 mi) of high-speed railway to the Swedish railway network. At up to 250 km/h (160 mph) this is also the highest-speed track in the country. The route branches off from the Ådalen Line at Höga Kusten Airport just north of Kramfors and goes via Örnsköldsvik to Umeå where it connects to the Umeå-Vännäs line and the Main Line Through Upper Norrland. The railway line has 140 bridges and 25 km of tunnels. Passenger traffic between Umeå and Örnsköldsvik began in August 2010. The delayed upgrade of the ERTMS signal system on the Ådalen Line meant that traffic south of Örnsköldsvik did not begin until 2012. There is also a harbor where cargo ships load and unload lumber and other merchandise. Prior to Sweden's joining the European Union, Örnsköldsvik had a direct ferry connection to Vaasa, Finland. This ceased operation after entry into the European Union along with the abolition of tax-exempt trade between the member states. The harbor now rarely sees passenger traffic on any large scale. Being situated on the European route E4, the city is well connected with bus lines. A coastal line from Haparanda in the north to Stockholm makes regular stops at the bus depot in Örnsköldsvik. A cross-country route to Östersund starts and terminates at Örnsköldsvik bus depot. Due to the hilly surroundings, hiking and exploring the scenery of the High Coast is popular in the area. In the wintertime skiing and ice hockey are both popular. Both cross-country skiing, alpine skiing and also ski jumping are practiced in the downtown area. In international sports, the town is also known for having hosted the inaugural Winter Paralympic Games, in 1976. The 2008 European Curling Championships also took place there. Since Örnsköldsvik is a coastal town, there are also beaches near town, as well as campsites. There is also an indoor water park called Paradisbadet, with one of the longest water slides in Europe. The main spectator sport in the town is ice hockey, with the local team Modo Hockey in the HockeyAllsvenskan, the second highest league for ice hockey in Sweden after being relegated from SHL after season 2015-2016. IF Friska Viljor has been successful in ski jumping and the ski jumping hill Paradiskullen is a local landmark, visible from downtown. The local football teams aren't quite as successful, but still popular. On the men's side especially the teams Friska Viljor FC from central Örnsköldsvik and Anundsjö IF from Bredbyn outside of town, and women's Själevads IK. A couple of floorball teams from town have also had some success. A new golf course, Veckefjärdens Golf Club, to the south of the centre is owned by local celebrity ice hockey player Peter Forsberg. The islands surrounding the coastal area of Örnsköldsvik are big tourist attractions which can be reached by ferry. 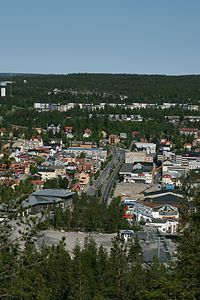 Örnsköldsvik is the birthplace of many world-famous ice hockey players, including Stefan Öhman, Nils Johansson, Per Svartvadet, Peter Forsberg, Markus Näslund, Niklas Sundström, Andreas Salomonsson, Magnus Wernblom, Mattias Timander, Victor Hedman, Tobias Enström, and the twins Daniel and Henrik Sedin. The Sedin twins were top players for the Vancouver Canucks, and Hedman plays for the Tampa Bay Lightning. Many stars from hockey's previous generation, including Anders Hedberg, Thomas Gradin, and Anders Kallur were also either Örnsköldsvik natives (Hedberg) and/or played in the town for the Modo Hockey club. Frida Östberg,is a Swedish retired football midfielder who played for Umeå IK, Linköpings FC and Chicago Red Stars of Women's Professional Soccer. She is a former member of the Sweden women's national football team . Malin Moström, former captain of the Sweden women's national football team is also a native of Örnsköldsvik. Miah Persson, a Swedish soprano, active internationally and in recordings. Magdalena Forsberg, cross country skier and biathlete. Hans Hedberg, sculptor known for his ceramic fruit. Märta Norberg, cross country skier at the end of the 1940s and beginning of the 1950s. Tomas Haake and Mårten Hagström, members of (drummer and rhythm guitarist) the Swedish technical metal band Meshuggah. Thomas Hammarberg, diplomat and human rights activist. Niklas Edin, skip of the Swedish curling team at the 2010, 2014 and 2018 Winter Olympics, winning silver and bronze medals, and a three-time world champion. Per Marklund, internationally recognized luthier. Yvonne Alt, worldwide known dancer. Åke Nordin, inventor, successful entrepreneur and founder of Fjällräven. Maud Olofsson, Politician is a Swedish former politician who was leader of the Swedish Centre Party from 2001 to 2011, Minister for Enterprise and Energy from 2006 to 2011 and Deputy Prime Minister of Sweden from 2006 to 2010. She was a member of the Riksdag from 2002 to 2011. Åsa Domeij, politician and an agronomist by training. She was a member of the Riksdag from 1988 until 1991 and then again from 2002 until 2006. Solveig Hellquist, politicianis a Swedish Liberal People's Party politician , member of the Riksdag 2002–2010. Emma Nordin is a Swedish ice hockey player. Peter Artedi was a Swedish naturalist and is known as the "father of Ichthyology." Malin Hållberg-Leuf is a Swedish former competitive figure skater. She is the 2006 Swedish national champion. Eilert Pilarm is a Swedish Elvis impersonator. He gained fame when he performed on Morgonpasset in 1992. Kristina Lundberg is a Swedish ice hockey player. She won a silver medal at the 2006 Winter Olympics. Anton Hörnfeldt, is a Swedish Fashion Designer based in New York. M/S Silver Shadow visiting Örnsköldsvik, with Swedbank Arena (now Fjällräven Center) in the background. The town square Stora Torget in central Örnsköldsvik. ^ a b c "Tätorter 2017 – befolkning, landareal, andel som överlappas av fritidshusområden" (in Swedish). Statistics Sweden. 28 March 2018. ^ "Royal ceremony marks Botniabanan opening". Railway Gazette International. 2010-08-31. Wikimedia Commons has media related to Örnsköldsvik. 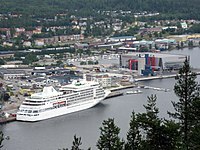 Wikivoyage has a travel guide for Örnsköldsvik. (in Swedish) article Örnsköldsvik from Nordisk Familjebok (1922).